What doesRadio Frequency Identification Reader (RFID Reader)mean? Radio frequency identification reader (RFID reader) is a device used to gather information from an RFID tag, which is used to track individual objects. Radio waves are used to transfer data from the tag to a reader. RFID is a technology similar in theory to bar codes. However, the RFID tag does not have to be scanned directly, nor does it require line-of-sight to a reader. The RFID tag it must be within the range of an RFID reader, which ranges from 3 to 300 feet, in order to be read. RFID technology allows several items to be quickly scanned and enables fast identification of a particular product, even when it is surrounded by several other items. RFID tags have not replaced bar codes because of their cost and the need to individually identify every item. RFID technology uses digital data in an RFID tag, which is made up of integrated circuits containing a tiny antenna for transferring information to an RFID transceiver. The majority of RFID tags contain at least an integrated circuit for modulating and demodulating radio frequency and an antenna for transmitting and receiving signals. Frequency ranges vary from low frequencies of 125 to 134 kHz and 140 to 148.5 kHz, and high frequencies of 850 to 950 MHz and 2.4 to 2.5 GHz. Wavelengths in the 2.4 GHz range are limited because they can be absorbed by water. 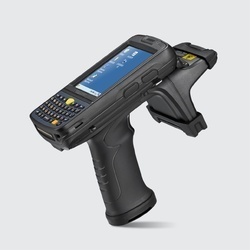 Chainway’s C4000UHF Handheld RFID Reader provides high-performance UHF RFID reading/writing capability. It is designed to support EPC C1 GEN2 / ISO18000-6C protocol and equipped with class-leading R2000 UHF module or cost-effective UHF module that covers frequency ranges for most areas. 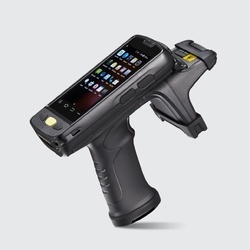 This versatile device can also be configured with class-leading high performance 1D/2D barcode scanning and a variety of wireless connections such as Bluetooth, 3G, and WiFi. Chainway C3000UHF mobile computer provides high performance UHF RFID capability. It supports EPC C1 GEN2 / ISO18000-6C protocol, and can be equipped with class leading R2000 UHF module or cost-effective UHF module. Enterprises can deploy it in asset management, retail, warehousing, fleet management and etc.